Are you tired of simple, mundane binary options trading platforms that offer a limited choice in trading and services? If so, Boss Capital might be exactly what the doctor ordered. They offer only the finest in Binary options trading, along with Forex, stocks and any other financial instrument you might be interested in. 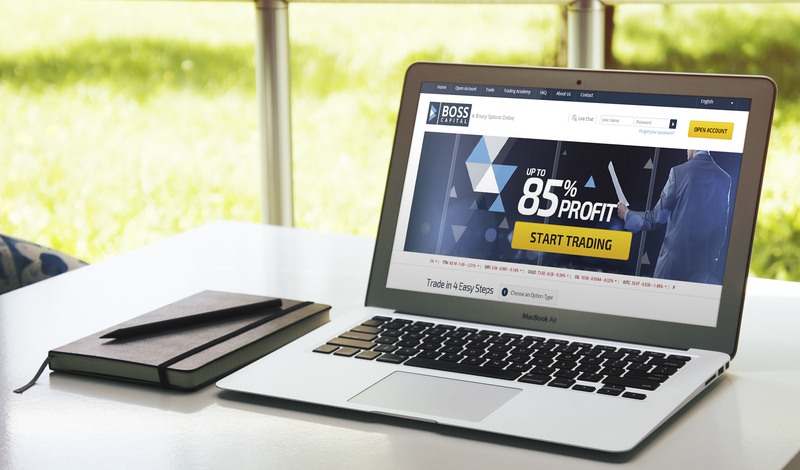 Not only does Boss capital site feature one of the simplest, user-friendliest trading platforms on the market, but their services extend well into the banking sector as well. When it comes to choosing a reliable partner, this UK-based broker is the way to go. As for the site itself, Boss Capital chose a simplistic design, without flashy colors that would give you epileptic seizure, featured by some of the other brokers on the market. The banners are what you’d expect from a modern site, and the requirements for opening an account are pretty straightforward. The trading platform also acts as a mini tutorial, giving you step-by-step directions on how to conduct your trade. Price updates happen in real time, and the home page also offers a wide selection of learning aids, centered around the “academy”, Boss Capital‘s own collection of tutorials, texts, videos, eBooks and webinars dedicated to training you to be the finest trader you can be. Their contact options are also a priority, as you can either email them or start an online chat if you need additional information; their operators will know what to do to help you out. One neat option is the “quick start”, enabling you to get started with minimal effort and without additional (needless) inquires, at least on their part, for people who appreciate discretion. Boss Capital‘s trading platform offers numerous options, but our focus in on the binary kind, so let’s try to stay close to our objective, shall we? What draws your attention from the get-go is the sheer selection of binary options they offer. Do not be mislead by the demo version on the home page; the real deal is far more impressive than you would think. Standard call/put options also have the above/below subcategory, while those who prefer one touch options can go for touch/no touch or high yield variety. Boundary binary options also feature a high yield version, and finally, the short term binary options expire in 1, 2 or 5 minutes, whichever you choose. While one touch, boundary and short term binary options usually feature a somewhat limited choice, call/put binary options will absolutely blow your mind. Ten basic currency pairs are followed by a myriad of commodities, indices and other possibilities, along with a chart that enables you to analyze data in real time. Boss Capital requires a $200 minimal deposit from its users, with a 100% bonus. Their return is capped at 85%, and they seem adamant about it, for now at least. One of the main features of Boss Capital is its plethora of banking options, meaning you never have to worry about cash withdrawal.